The buzz lately has been about all the stores opening in the city’s newest shopping center, Canton Crossing at Boston Street at the bottom of Brewer’s Hill at South Clinton Street. The area and the residents have been crying out for something substantial. Along with the numerous stores comes restaurants and along with restaurants comes MISSION BBQ, a salute to the various American styles of BBQ and to the people who serve us: military, police, fire and emergency responders. MISSION BBQ, a fast casual restaurant known for its traditional American BBQ and dedication to honoring our service men and women, opened its first metropolitan location a week ago. Now downtown urbanites can experience MISSION BBQ favorites that neighboring Marylanders have enjoyed for years. A recent visit on opening day, dismal with rain, didn’t keep folks from lining up out the door. 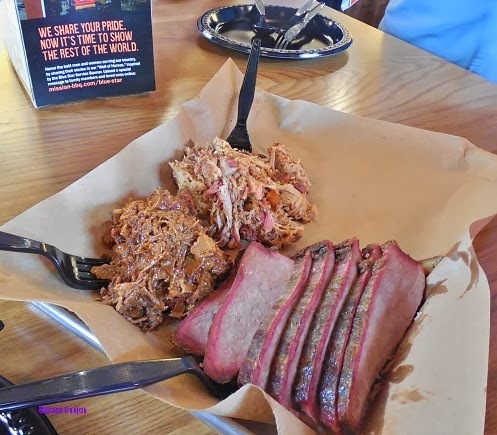 A few MISSION BBQ menu items include Texas Inspired Beef Brisket; Jalapeño and Cheese Sausage; and the bestselling North Carolina Pulled Pork Sandwich topped high with Cool Slaw, accompanied by an array of homemade secret sauces. Favorite made-from-scratch side servings include Maggie’s Mac-N-Cheese; Baked Beans & Brisket; and Green Beans & Bacon. Desserts include an assortment of homemade Southern seasonal sweets. Check out the slideshow, video and complete story HERE.